The deadline for signup has passed and the trip is closed. The trip includes 7 nights of lodging, round trip transportation between Santa Barbara and Telluride, 5 days lift tickets, welcome party, hot tub parties, farewell dinner and no limit on the amount of fun you can have. You may tailor your own options to get to the right trip for you. The skiing at Telluride can be as hard or easy as one wants it to be. Beginners and intermediates will find plenty of agreeable terrain around Mountain Village and mid-mountain, where the terrain is gentler. For experts, Telluride has some of the best in-bounds terrain in Colorado. The charms of Telluride’s ski terrain are matched by the allure of town which is a full blown ski town masquerading as a sleepy historic community. Colorado Avenue is lined with great eateries, shops and several dive-ish bars worth a pint or two of most skiers’ time. Telluride is not too big, not too small, but just right. Locating new construction in Mountain Village was a brilliant touch that allowed the town to keep its amazing frozen in time vibe and character, all surrounded with the most stunning mountain views in the nation. We will be staying at the very well appointed Bear Creek Lodge in a combination of 3BR/3BA and 4BR/4BA condos. Each condo has a full kitchen, dining room and living room so there is plenty of space for entertaining. Bear Creek Lodge’s Funicular, which gives you private access to the slopes is almost "Ski-in/ski-out". 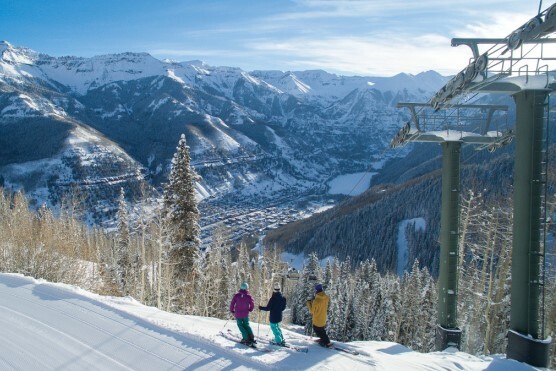 The ride takes 4 minutes, after which you will exit onto Lower Village Bypass on the Telluride Ski Resort. A short ride down this run will take you to the base of chair 1 and chair 10 providing easy routes to the rest of the mountain. Saturday morning we will meet at the Elks Lodge in Goleta for our bus ride to LAX where we have a Direct flight on United Airlines to Montrose Co. Upon arrival in Montrose we will have a bus service to get us the rest of the way to Telluride, arriving at our condos early in the evening. If you purchase your lift tickets with the club package you will receive the group discount. Our Ticket offerings are 4, 5 or 6 day lifts. Sorry, a Senior discount is not offered. prior to departure (10/18/18). Once the tickets have been purchased no refund for this item is available. Potentially it can be transferred, usually at significant cost. Base trip costs (lodging, lifts etc) are paid to the trip provider 75 days prior to departure (11/12/18). No refund will be available unless the trip captain can fill your spot.